Makenzie received a $15,000 college scholarship, a netbook computer and a $25,000 technology grant for a new computer lab at her school. Her doodle will also be featured on the Google.com homepage tomorrow, May 27, for millions of people to enjoy all across the country. Our four winners were announced at an event today at the Google New York office and were celebrated at the Smithsonian's Cooper-Hewitt, National Design Museum, where we also unveiled an exhibit of the 40 regional winners that will be on view until August 15, 2010. The finalists were treated to a day in New York City, including doodle classes with our doodle team and the opportunity to meet some of this year’s expert jurors who helped judge this year’s final doodles around the theme “If I Could Do Anything, I Would..." Judges at today’s event were well known artists and animators from Disney, the Charles M. Schulz Creative Associates and Peanuts gang, Barbie/Matell and the Sesame Street Workshop. A special thanks to all those who voted and helped us select this year's winner. Thank you to all those creative kids out there who submitted entries — and the teachers and principals who work so hard to get their students recognized. We hope you'll doodle with us next year! 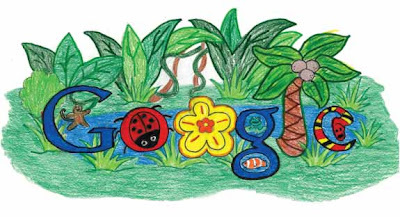 Your millions of online votes helped us pick the winners of this year's Doodle 4 Google competition. Today, we're pleased to announce the results. Congratulations to Makenzie Melton, a third grader at El Dorado Springs R-2 Schools in El Dorado Springs, Missouri. Her winning design, entitled "Rainforest Habitat,” expressed her concern that "the rainforest is in danger and it is not fair to the plants and animals.” Makenzie’s design triumphed over more than 33,000 student submissions from all over the country. Makenzie’s colored-pencil creation beautifully embodied this year’s theme.